An expert from Gurney's Seed & Nursery shows how to prune medium to large sized stone fruit trees. 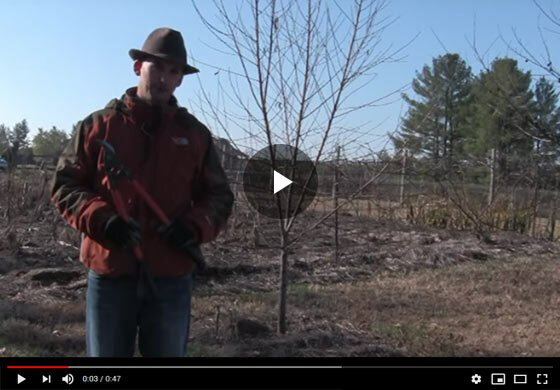 Learn the basic cuts, their purpose and effect on the trees' overall health and stability. Hello, today we're going to be pruning some stone fruits. Here's a peach and it's a three year old tree that has not yet been pruned and we're going to open it up a little bit, again, like the earlier demonstration where we had a younger tree. The same process happens here, we're just taking out some bigger limbs, keeping it simple and just making few big cuts. I'm taking out this limb to open up the center to balance the tree a bit. I'm staving back this limb here to balance a little bit so the fruit load doesn't weigh the limb down too much and doing the same over here, same purpose. The final step on this tree are these lower limbs, which, the fruit, when there's fruit load, will just be hanging into the soil area. So all of these lower limbs are really too low. So that's the finished pruning on this tree. Just a few cuts should open it up, allow more sunlight to the leaf surface and better air through the tree.